Hello! I apologize for taking such a break in between posts; but I promised that my next post would be more of a meal and less of a baked good. I’ve had Arroz con Pollo prepared in different ways, restaurants and home cooks seem to have different methods of preparing this dish. When I set out to make it I was hoping to get the same orange colored rice that I remember from being a little guy, but it was not to be! Unlike French and Creole cuisines that rely on the bases Mirepoix and Trinity as their respective bases, most Spanish, Caribbean and Latin American cuisines find flavor in sofrito. There are a few prepared versions of sofrito available in jars at a grocery store, but it is summer and tomatoes and peppers are in season; sogate why not make our own? *Note, if you don’t like cilantro’s dominant flavor, feel free to use just a bunch and a half. 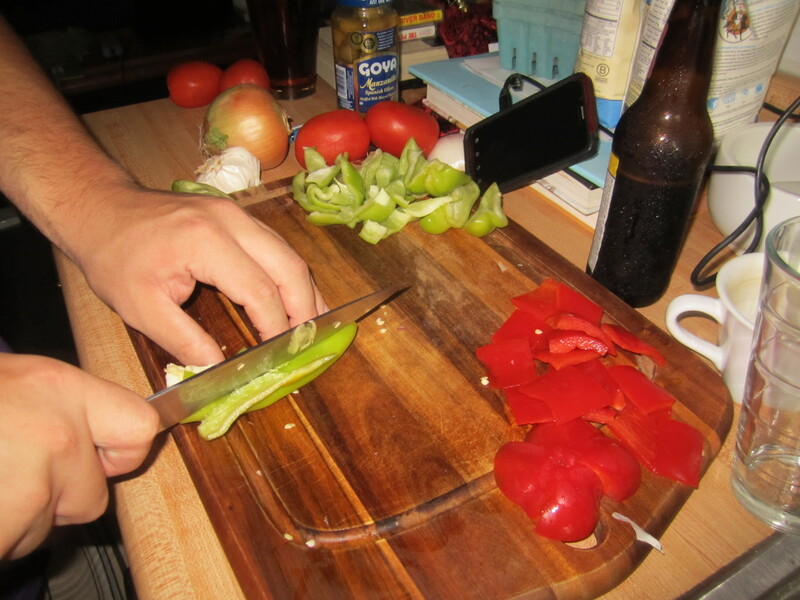 Loosely chop up the cubanelles, tomatoes red pepper and onion, afterwards peel the garlic. Loose chop, remember to remove the seeds! 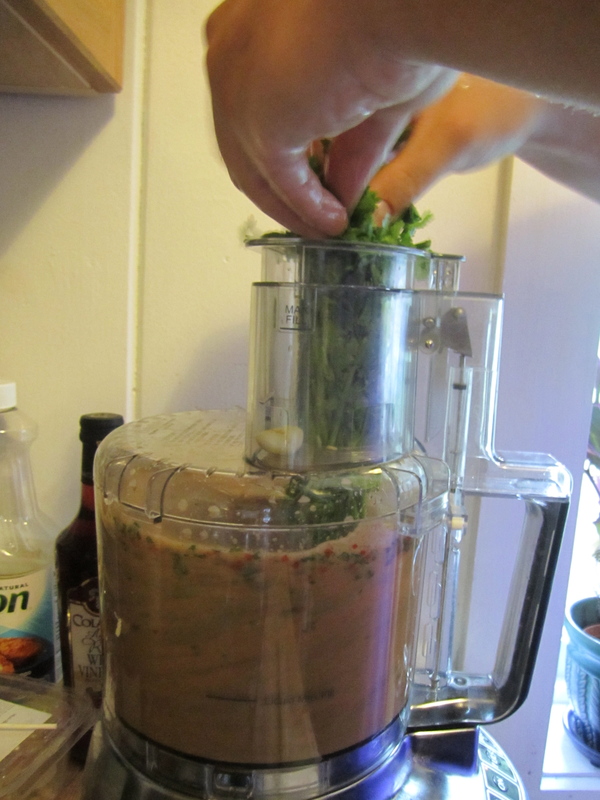 Otherwise, place the onions and cubanelles into the work bowl of a food processor and chop loosely using pulse–in the end this will be like a salsa– then use the food processor until it is spinning continually and ad d the ingredients one at a time, and then when it looks like it might go well with tortilla chips it’s ready. Sofrito! You will only need over a half cup of this stuff, so save the rest. It freezes very well, so make sure to hold onto it for a while. 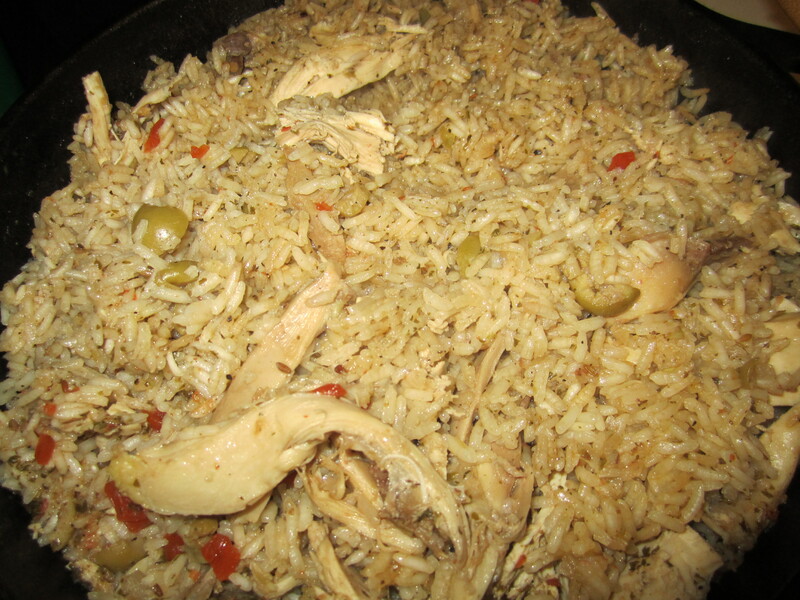 The recipe that I am using for Arroz con Pollo is a combination of recipes I have read, and some of my own taste. Before I go into the process, it is worth saying that Arroz con Pollo is usually prepared with cubed or pieces of chicken, the other night I made chicken broth and had all of the meat already cooked, so instead of tossing the tattered poultry into some mayo-laden salad, Arroz con Pollo is a vehicle to glorify carcass and meat together–as was intended! Roasted red peppers come canned, which I think is gross. The best way to make them is to chuck them into a piping hot oven, or directly on a gas burner(a grill also works well for this). 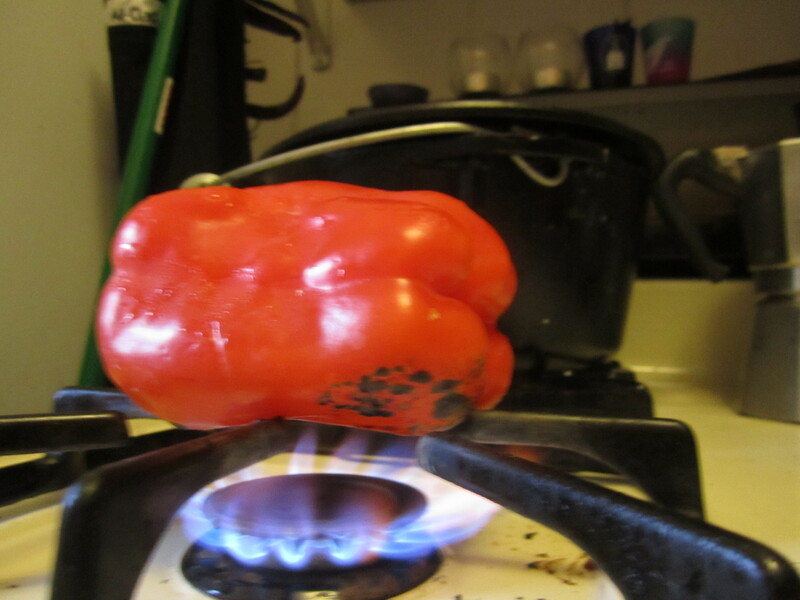 Once the entire pepper is charred, place it underneath a metal bowl and let stand for at least ten minutes, then rub off the skin and use in whatever way you wish. Place two ten inch skillets over high heat and add the olive oil and heat until it shimmers. 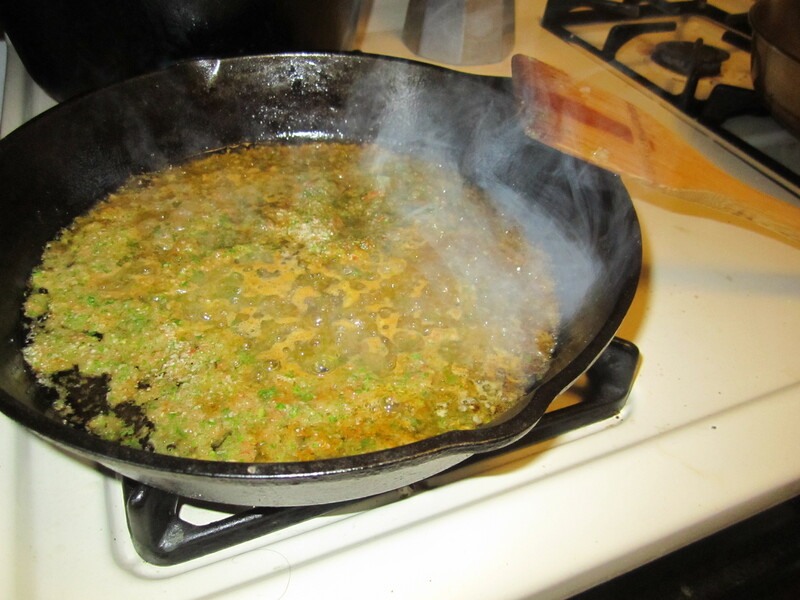 Then when you are sure it is hot, add half of the sofrito to each skillet and cook until all of the water is cooked out of the vegetables, you will know when this happens because it will no longer hiss or bubble and the sofrito will turn a light brown. Season this mixture generously with salt and freshly ground black pepper. Next add two cups of rice into each skillet. Toss the rice to coat it in oil and to toast them. Next add the cumin and cloves, after a moment add the chicken and olives , and chicken broth. Bring this to a boil, cover and drop the skillets to low heat. Once all of the liquid has been absorbed [20 minutes depending on kPA, psi, altitude &c.] the meal is complete! Top with roasted red and a few fresh olives, buen provecho. I had planned on a cooking project for my second post, but because of an extremely busy week at the restaurant and budgeting needs I did a baking project today. Like the hamburger rolls, I cannot remember someone baking Chocolate Meringue Pie at home–so after a bit of thinking I came up with the following recipe. 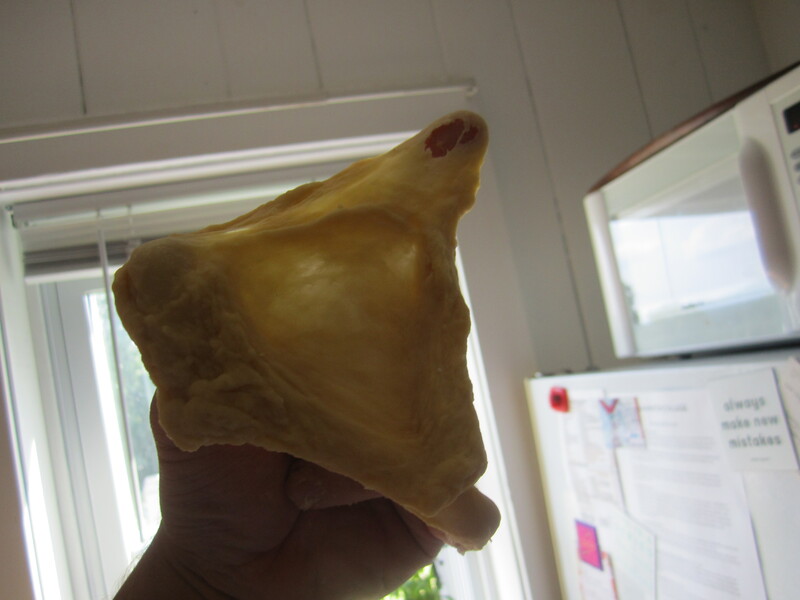 My pie is not beautiful, however it is tasty–and a technical challenge. Of course, one might choose to use pre-made pie crusts–but they are easy to make and quick and can be frozen for future use. 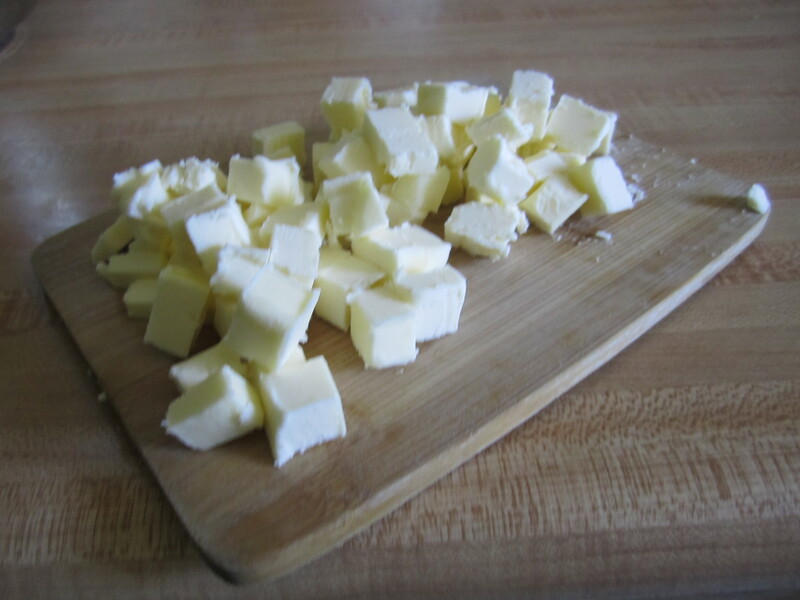 First, cut the butter into small cubes and put them into the freezer to keep them hard. Sift the flour and salt into the large bowl, beat the egg yolk lightly and add the 4 tbs of water to the egg yolk. 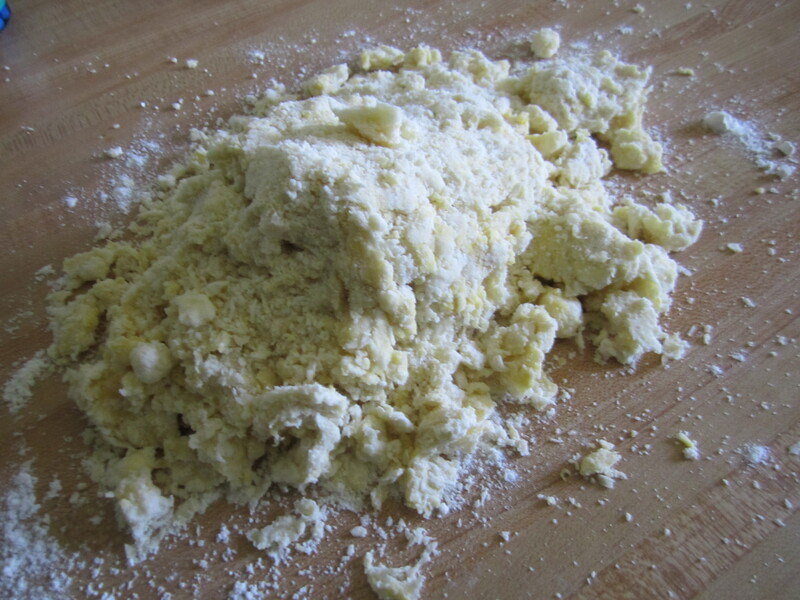 Cut the butter into the flour until the texture becomes similar to that which of bread crumbs–this is a rough description, basically you don’t want huge blocks of butter in the flour, this is what makes pie crusts flaky. 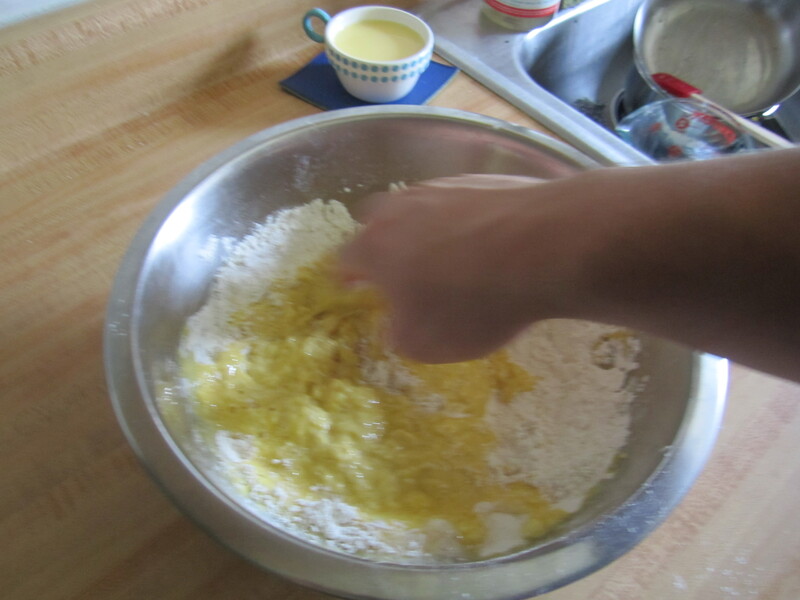 After cutting in the butter, make a well in the center of the butter-flour and mix in the wet ingredients gently. Pour the contents of the bowl onto a lightly floured surface and knead gently-to combine–then wrap the dough in pie crust and put in the fridge for an hour (or the freezer for half an hour). 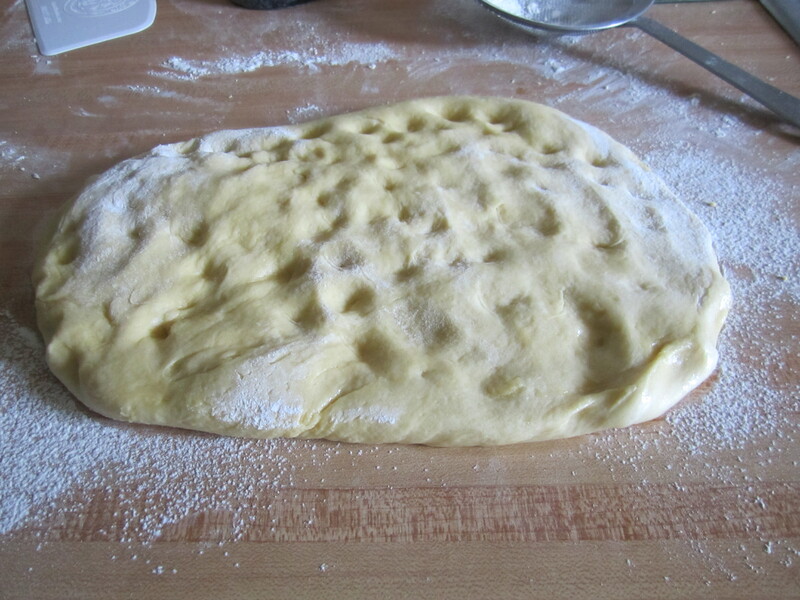 Before Kneading the pie crust dough, it comes together very well. While the dough is chilling, get an 8 inch pie dish and grease and set the oven to 400°F, then roll out the pie crust and cut out the needed shape. Place the dough in the pan dock it gently (to let out steam, otherwise your crust may dome) and put a layer of parchment in the shaped dough and then fill it with dry beans (rice also works). Put the dough in the oven, bake for seven minutes (or until set) an then bake for another eight minutes without the improv-pie weights and let cool. Combine the cocoa, sugar, salt, cornstarch and milk in a saucepan and put over medium-high heat until it reaches a boil whisking continuously. Continue to whisk for a minute after the boil. Beat the two egg yolks in a small bowl and combine half of the chocolate mixture to the egg yolks–again whisking continuously– and then replace the egg-chocolate mixture into the rest of the chocolate mixture and put over medium heat for 1 minute. At school many people have asked me if I would consider a tattoo–I never half a full answer, but I am sure that if I did get one it would be of a whisk. Why interupt the recipe with this preface? 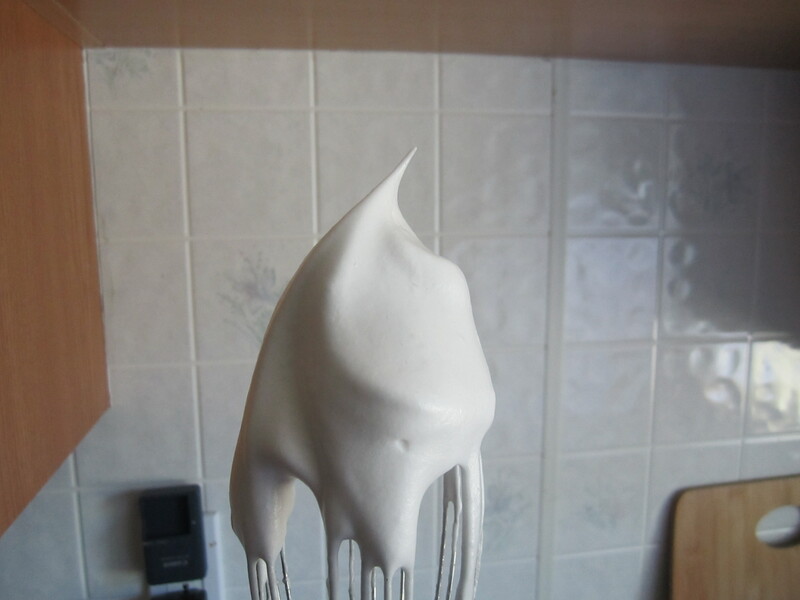 Because you will need energy and a whisk in order to make Meringue–To obtain stiff peaks put 2-3 egg whites in a metal or glass bowl (do not use plastic) and whisk briskly and continuously. After 3 minutes add a tbs of sugar and keep whisking, whisking and whisking! 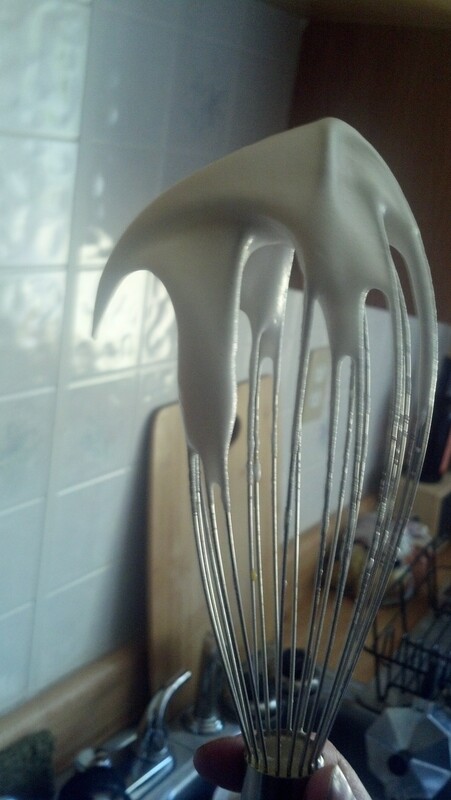 Repeat this until you have obtained stiff peaks at the end of the whisk. Now–take a moment to rest your arm and then place the meringue on top of the uncooked pie, sprinkle with sugar and then bake for 15 minutes. 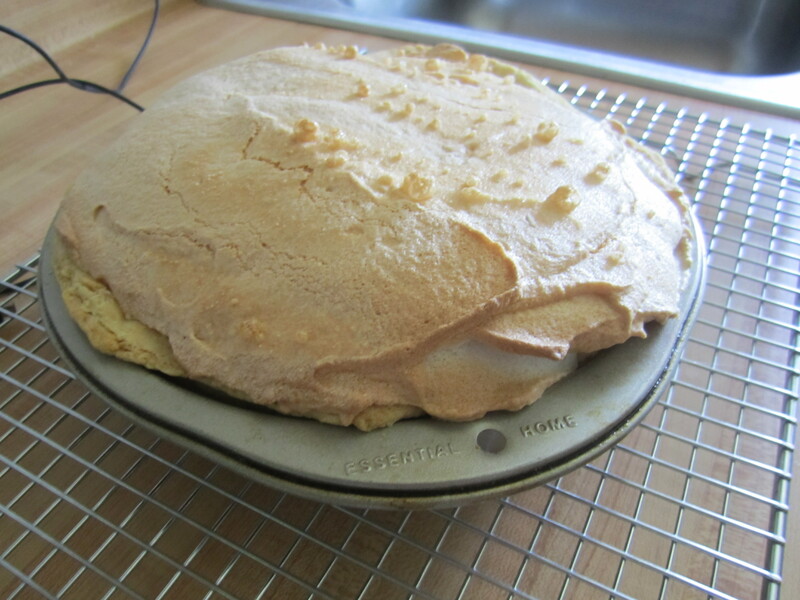 I was not creative with the meringue, but you can use manipulate stiff peaks as decoration for the pie. Cool the pie for at least 2 hours, the custard will not stabilize if it is not completely cooled. Rough, tough and hard to bluff. Assuming nobody reads the “About” page on blogs during a first glance a secondary introduction is excessive, however–to be brief–Hello! Ever walk down an aisle at a super market pick up a package of ________ and just hold it for a second? The texture is familiar, the scent through the thin film is reassuring, the little stamped date is informative and the series of numbers that assault the eyes on the reverse of the package are “important”. Dorm rooms are filled with these packages, and with reason. Those products are often cheap, filling, consistent (last a bit longer than the date suggests) and easy. Cooking isn’t easy–at least not the way I cook. Most of my recipes are simple, with short instructions, but almost all of them require work. Besides, who wants to work more when tackling a job and being a full-time student? I do. Regardless, it’s summer now, let’s talk about hamburgers. 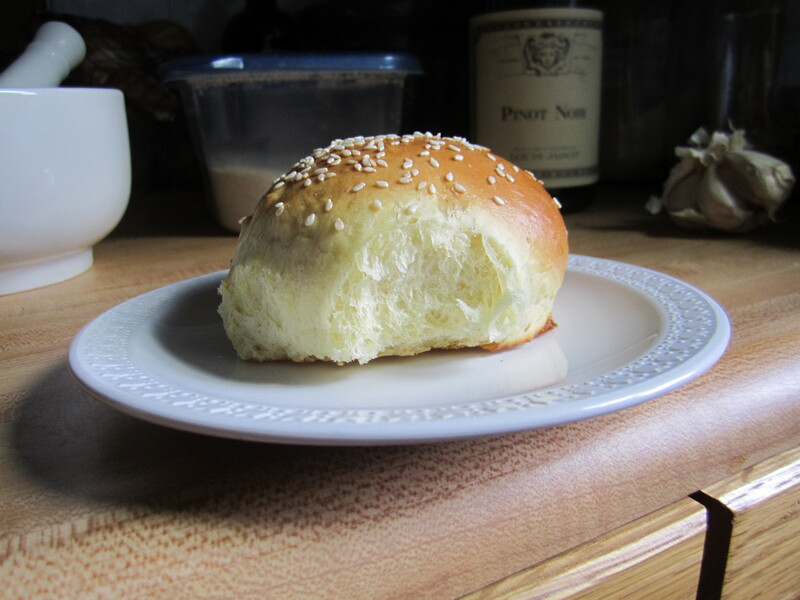 With that in mind, the recipe below is not of the namesake, this is a recipe and process for the familiar sesame bun. Whisking the yeast and sugar. 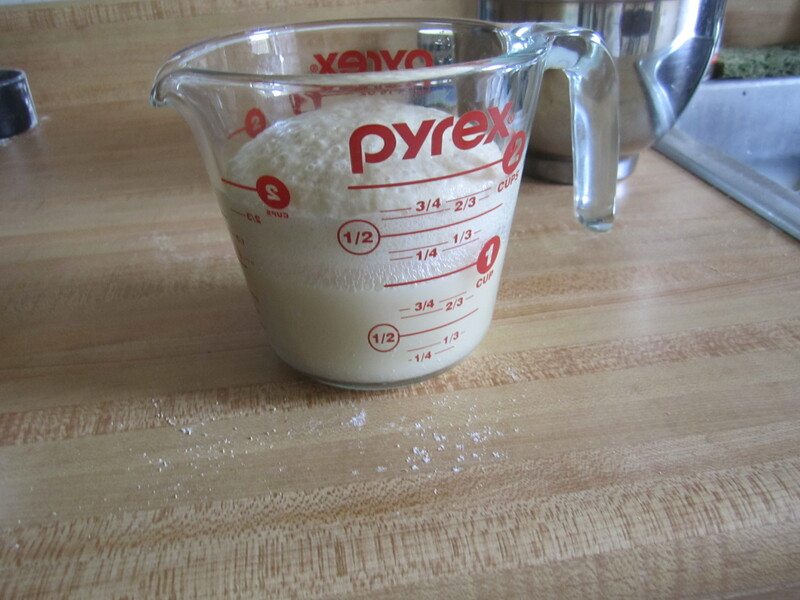 While the yeast is activating, sift the flour into a large bowl, add the salt and stir to combine. Create a well in the center so that when you add the yeasty water (not beer! though you could use warm beer and yeast for a more hoppy bun), egg and butter they will remain in the center. Just before you are ready to introduce the dry and wet, beat an egg and a yolk in a small bowl with a fork (using a whisk is a possibility, but the extra air is superfluous). Dorm kitchens are frequently equipped with microwaves, you can choose to use one– I enjoy washing dishes; so I melt my butter in a pan, this also makes the butter slightly nutty in flavor and color. 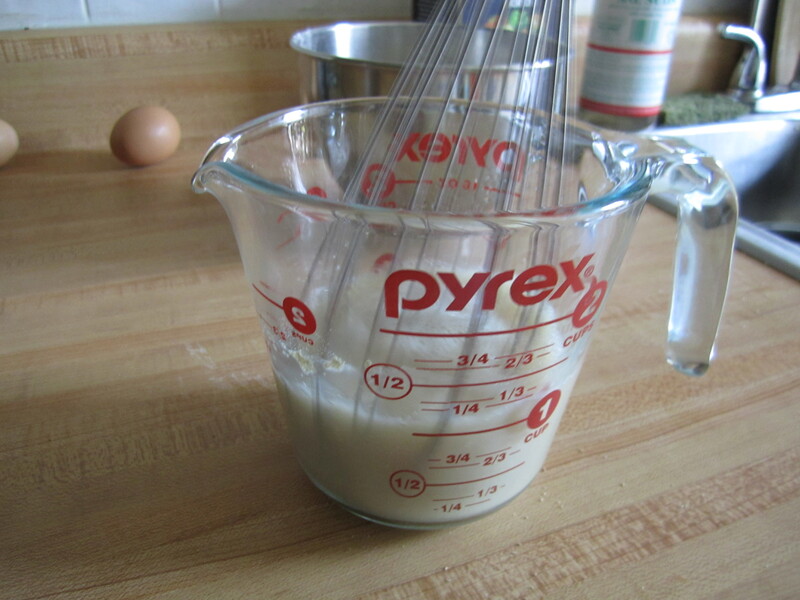 Add the yeast, egg and butter to the well and combine. 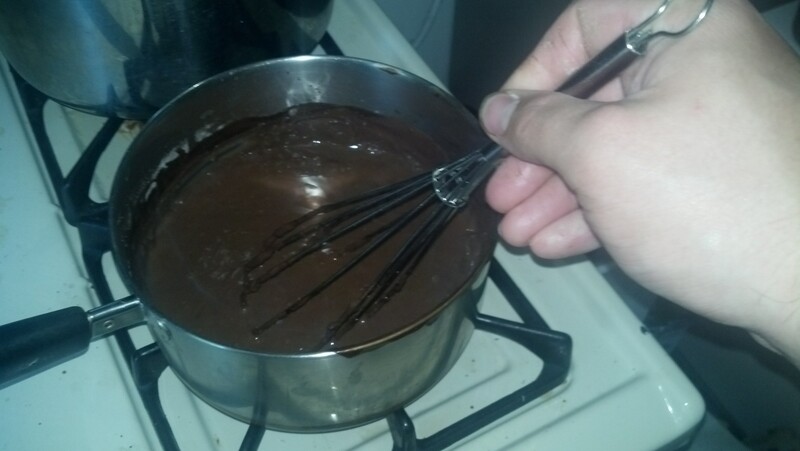 I use my hand to mix the ingredients, it’s very sticky stuff. To do this, arrange all of the fingers of your dominant hand so they are fixed to a point and (at first) gently make circles with your hand-cone, as the flour absorbs the moisture it will become harder to do this, but stand mixers are expensive and hands are incredible. Organic Stand Mixer, dough hooks, whisk and paddle attachments can all be attached. Consistency of the pre-kneaded but fully integrated dough. At this point, remove the dough, and lightly grease the bowl with butter (it makes everything better) now knead the dough on a lightly floured surface for 10-15 minutes. Kneading is an exercise, I don’t have pictures for this recipe, but I will have them for future ones. 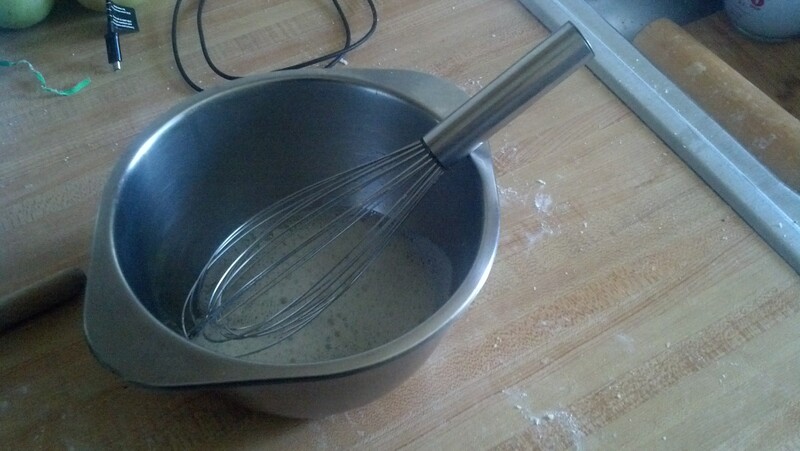 If you have a stand mixer you have to regulate how long you knead for–for fear of over-kneading! It is basically impossible to do this with your hands, kneading is a time for thinking about something other than the activity (as you might do for whisking if making hollandaise at home). We knead the dough in order to form the meshy protein structure gluten, which is what allows for breads to hold onto air and expand without exploding. 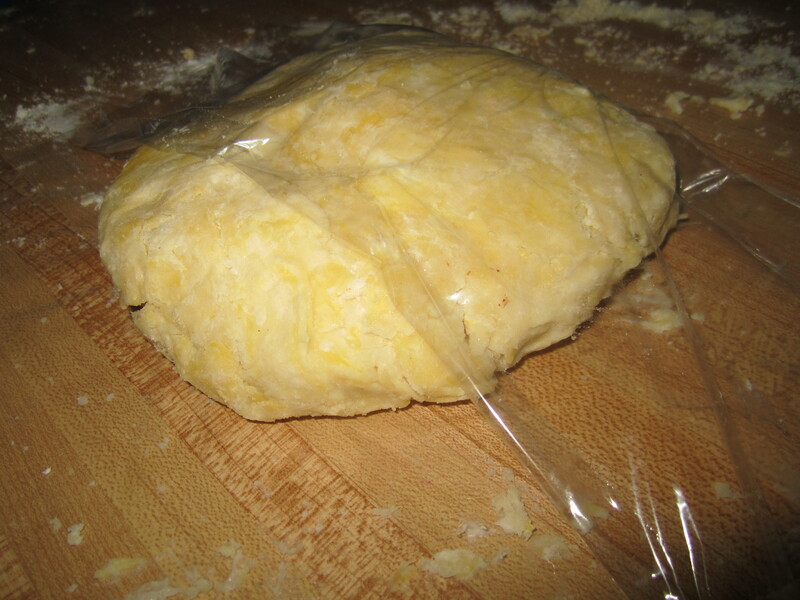 You’ll want to knead until the dough loosely passes the window pane test–take a small piece of dough and stretch it between four fingers and hold it up to a light, the more you stretch it (with fewer tears) the more translucent it will become. Rough window pane test- it doesn’t need to be perfect, but it requires decent kneading! Now, set the dough in the metal bowl and cover with plastic wrap and put it somewhere–(if you have a communal fridge, I wouldn’t recommend there, vagrant fragrances imbue dough with icky stuff) a warm place is good for an hour and a half, a refrigerator would take about 8-12 hours for the dough to double in size, but it will be more flavorful–recover the dough and put it on a lightly floured surface. Most people tell you to punch the dough down or to knock it back–food does not like violence gently use your knuckles to press the air out of the dough. Day at the Spa, with tanning soon to follow! At this point you will need a half sheet tray, or a cookie sheet, furthermore, grease it lightly with butter. Take the dough and cut it in half, then cut those two in half, &c. so you have the dough squares. at the desired size. Take the dough squares and rolls them by encompassing all but the bottom of them in your hand and moving your hand in a circles against a wooden surface, this will give you a tight skin. 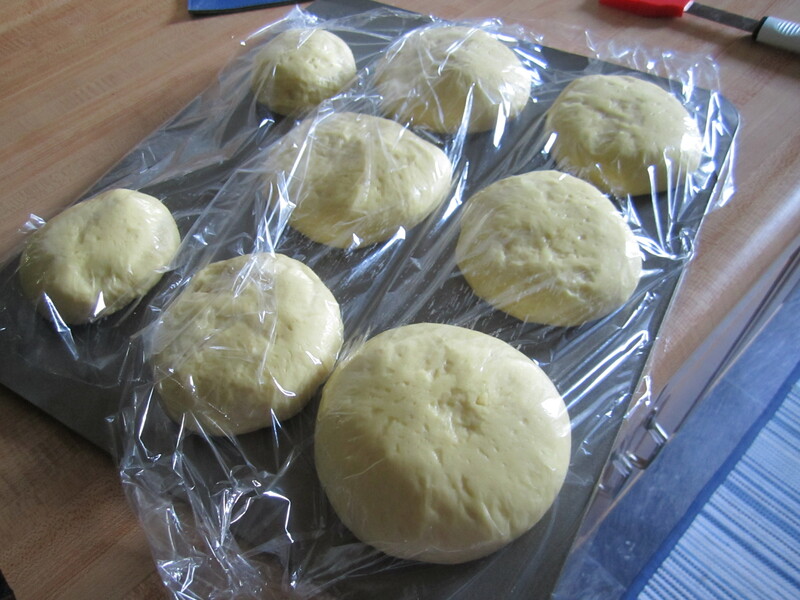 Put them on the sheet as you go and then wrap with plastic. The tight fit will get tighter as they rise, this is okay! Let rise until they are doubled in bulk, meanwhile set the oven to 375°F. Remember the third egg from the ingredient list? Crack it and beat briskly with a tiny amount of water. 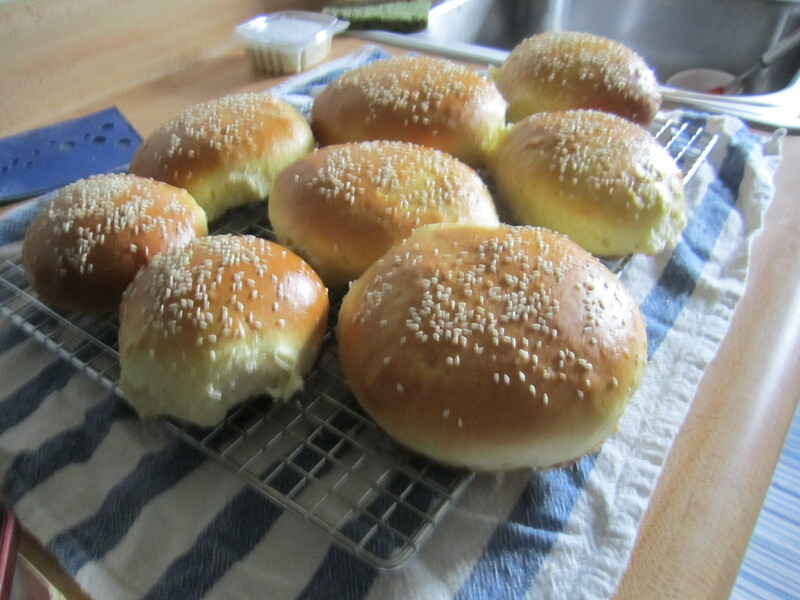 Once the rolls have risen, remove the plastic and apply the egg wash and sprinkle on the sesame seeds. Put into the oven for 30 minutes to an hour–why such a vague time period? Glad you asked, your altitude, exact oven make and model, whether you use gas or electric all effect this. I’ll be honest–if you’re buying all of the equipment and have no pantry that I used this may seem like an expensive project. Flour is cheap if you buy it in 50lb bags–get a couple of friends together and split the cost, it’s around $25, water is free in a dorm (though filter it if you think it tastes like pool water from the Y) eggs are cheap depending on where you live and how you get them, I use locally produced eggs, &c. for the rest of the ingredients. If you live in New England, Tag (Garage, lawn, church &c.) Sales are a great way to get cooking tools for next to nothing. A lot of people purchase one too many mixing bowls and then want to sell them. Like a mathematical function, most inputs have an output, the same particularly true for bread, a simple list of ingredients with a rigorous process yields elegance.